Inspired by Brian's description of his fairly sophisticated radio setup with FM transmitters, tuners, and multiple traditional and Wifi radios, I looked into my choices for a high performance FM transmitter. In searching for the "best" such unit I discovered that the large and vibrant Christmas light show hobby community use FM transmitters extensively to synchronize their display lights with music which you can hear on your car radio. As such there is a good deal of discussion on various FM transmitters on related online forums (see for example here). To make a story short, here are three good choices, and I would appreciate any comments on them, especially if you can point out major differences between them. I know that Brian uses an EDM unit and I think he's very happy with it. CCrane FM transmitter: Description, specifications, and manual are here. It retails for $69.95 (new) or $62.95 (refurbished, or returned, "orphan"), shipping from CCrane. Reviews are generally positive although four of the latest reviews on Amazon are quite poor and may point to a bad batch, or a quality control problem. However, with both CCrane and Amazon you have 30 days to return the item if you are not satisfied. This unit was originally marketed (and presumably designed, and is even now built) by Sangean. From what I could find the power output is 10 mW before modification, and it is FCC certified (Part 15). There is a very simple modification which allows one to boost the power output (and hence range) of the transmitter, especially if you extend the unit's telescopic antenna by attaching a long piece of wire to it. Read the Amazon reviews for the modification, or see here or here. 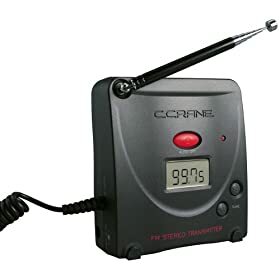 Among the advantages of the unit are that it can transmit in stereo, it comes with an AC adapter, has adjustable input level, and you have a wide choice of frequencies to transmit on. It's small, looks good too, and is the cheapest of the units described here. FM transmitters by EDM Design, a South African company. See here, and click through the features, operation, specs, and orders pages. Brian uses one of these units (the EDM LCD transmitter). Reviews are uniformly positive in terms of performance and long term use and reliability. The units are not FCC Part 15 certified, but are legal to use as long as you buy them in kit form and assemble them yourself, and of course make sure that you do not violate Part 15 regulations (which essentially state that your broadcast range should be limited to about 200 feet). It appears to me that the 10 mW unit (LED Series) should be enough for most users. An example is the EDM-TX-1/10EP kit which retails for $136, is switchable between 1 mW or 10 mW, and includes the PCB, parts, antenna, regulated 12V power supply unit, and a metal enclosure. Kit assembly is trivial, consisting of inserting a microprocessor into the board, and soldering a power jack into the PCB (very simple soldering - anybody can do it with a low voltage iron which you can buy form RadioShack). See instructions here. The higher-end EDM LCD series has more features, more audiophile performance, and higher power (up to 100 mW), and is more expensive too (complete kit without the RDS unit is $195). From what I can tell it uses a ROHM BH1414K integrated circuit at its core, which is among the best high fidelity FM transmitters made by ROHM (see here). See kit assembly instructions here. Users swear by the EDM units - they are apparently great bang for the buck, and are truly well designed and professional transmitters. FM transmitters by HLLY, a Chinese company. See both here and here. These can be purchased from the links above, or on Ebay. The units are not FCC Part 15 certified, and do not come in kit form, so I am not too clear on whether they can be legally operated in the US. My suggestion if buying them is to make sure your power levels are such that you don't go over the 200 feet FCC limit, especially since these are generally high power units. The most attractive unit here (both physically and in terms of performance) is the TX-01S FM transmitter which sells for $198 on Ebay (or you can start bidding and hope to get it at a lower price). See here and here. It has adjustable power levels and from what I can tell it also uses ROHM chips at its core, though I am not sure which one. It appears solid and well designed, and is currently the flagship FM transmitter manufactured by HLLY. Again the few users of these I have tracked down on the web are very happy with them. HLLY also makes the Eclipse-4000 and Orion-5000 FM transmitters, and licenses them to Mobile Black Box (seehere, where you can find more details and user manuals). These appear to be good choices as well. Until then, I hope this summary has helped you a little bit in narrowing down your choices for high quality, high performance FM transmitters for home use. I recently obtained a used Broadcastvision BV3001 FM transmitter at a good price. These are FCC Part 15 certified and perform very well. The unit saves its frequency when powered off and is switchable to Mono or Stereo. It's powered by a 12 volt AC adapter. These units are commonly used in health clubs for broadcasting exercise hall entertainment. You can usually find them on ebay - if you see one around $50-$80 grab one! Not mentioned is the Mobile Black Box V6000, which is a very small 200 mw FM transmitter. It's mono, and despite that the specs say it's power output can be varied below 200 mw, it doesn't work, so you have a constant .2 w output. The sound from this (mono) unit is excellent. I have it placed in my house so that it covers the house and deck and that is all...i don't want it 'broadcasting' to the neighborhood. I also have a .5 watt Hlly, but it is too high powered and also has a problem with sending RF onto the audio input cable so I have boxed it and will use it only if the world ends. Stereo on low power is an iffy proposition since the s/n ratio is not good and you get noise in stereo. As AM radio people know: a mono channel is best. The Mobile Black Box units are not FCC Part 15 certified and they are known for generating spurious harmonics, so just be careful that your broadcast range does not go beyond 250 to 300 feet (looks like in your case this is not an issue). Anybody looking for longer range might want to look into a Part 15 AM transmitter. I am responding to JP's post about stereo on low power. I use my Ramsey FM25B in mono mode because the s/n is better, but my EDM transmitter has an awesome s/n ratio in stereo. I broadcast the HD Radio stream of a local station to my Sansui and Marantz tuners. The s/n ratio is equal to or better than the analog broadcast of the same local station when tuned in on the same two tuners. I use my EDM set at the 10 mw setting, and cover my house, yard, and a few houses down the street nicely. The biggest factor that has helped my situation is finding that perfect broadcast frequency.